The National Agri-Marketing Association (NAMA) is comprised of 22 professional chapters in 6 regions nationwide and 33 student chapters at universities across the United States and Canada. NAMA members include professionals in agribusinesses, advertising and public relations agencies, commodity associations, and faculty, staff, and students. Nebraska’s professional Cornhusker Chapter has nearly 70 members and Nebraska NAMA student members are invited to Cornhusker Chapter meetings to learn about the latest trends and rub shoulders with marketing professionals. This network of professionals—at the state and national levels—provides valuable opportunities for Nebraska NAMA students. NAMA’s annual conference each April brings professional and student members together. The student marketing competition, opportunities for networking with professionals, and workshops by internationally known speakers are a winning combination for all who attend. 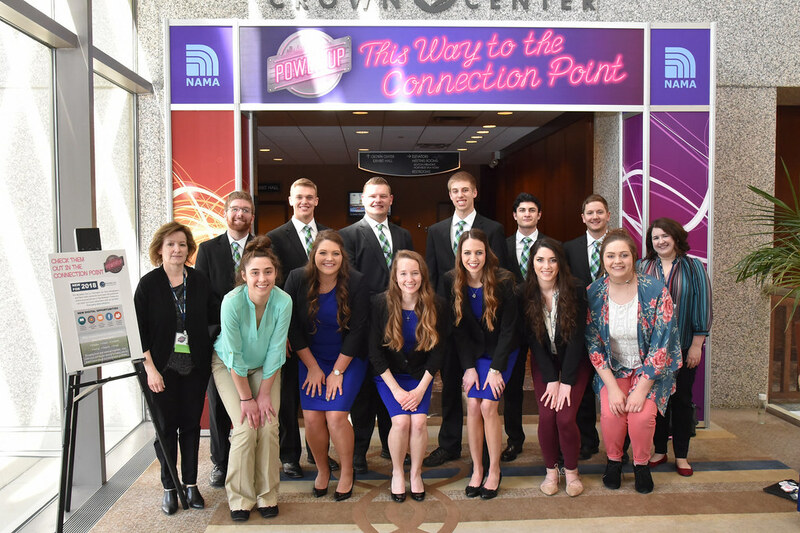 Twelve Nebraska NAMA students traveled to Kansas City for the 2018 national conference. They took in a luncheon with professional mentors, met professionals at the annual trade show, and interacted with students from other student chapters. Pictured below are the team members who traveled to the national conference. Back (l to r) Jack Allen (Elm Creek, NE), Brent Miller (Lyons, NE), Nathan Choat (Plainview, NE), Austin Harthoorn (Ainsworth, NE), Saleh Husseini (Omaha, NE), and Logan Greenwalt (Phillips, NE). Front (l to r) Cora Brott (Paxton, NE), Karly Niewohner (Scribner, MN), Marydith Donnelly (Bullard, TX), Erika Harms (Glenvil, NE), Jessica Weeder (Genoa, NE), and Grace McDonald (Phillips, NE). This year UNL NAMA students were involved in developing a product marketing plan for NuWhey, a nutritional beverage made with acid whey, a byproduct of Greek yogurt production. Greek yogurt producers typically pay to have acid whey transported to be disposed of in digesters as it cannot be dumped in water or on the ground. NuWhey builds upon the high-quality protein and probiotics in acid whey by adding prebiotics, additional probiotics, and fruit puree to create a nutritional beverage marketed to health- conscious adults in the Pacific Northwest. NAMA marketing plans must show a return to producer, and the introduction of NuWhey adds value in the dairy stream. The NuWhey marketing plan featured an Oregon-based dairy cooperative which produces Greek yogurt adding NuWhey to its line of products. Research showed strong promise for NuWhey in the Portland and Seattle markets, and financial research showed positive potential return to cooperative members. The team worked with Dr. Robert Hutkins, UNL professor of Food Science and Technology, Dr. Greg McKee, UNL professor of Agricultural Economics (cooperative specialist), several dairy operations, and local bottlers, distributors, and retailers in determining details of the plan. The team researched opportunities for new food products based on consumer preference trends and opportunities to add value in a food chain. Once potential products were identified, members researched economic, regulatory, and more in-depth consumer preference trends before selecting a product with the most promise. From identifying the best product to the right target market based on demographics and psychographics to the right balance of advertising, public relations, and social media based on the target market, students learned how effective decisions are made with respect to marketing a product. Nebraska NAMA did extremely well in the marketing competition, making it though two rounds before placing fourth in the final round. They were also fourth in the Outstanding Student Chapter competition and received fourth place in the John Deere Signature Award. Erika Harms, President of Nebraska NAMA, received a $1000 NAMA scholarship, and Rosalee Swartz received the Dr. John B. Riley Outstanding Advisor Award. It was a great year for Nebraska NAMA members who know first-hand about the experiential learning and networking that comes with involvement in NAMA. The Nebraska NAMA Chapter is proud of its accomplishments this year and is looking forward to a successful year in 2018-2019.